A new chocolate drink has hit town, created by Dutch Lady, with the proposition of ‘the tastiness of chocolate, with the goodness of milk’. The drink marks Dutch Lady Malaysia’s first powdered formulation of a chocolate drink, which is targeted primarily to shoppers and mothers, for family consumption. Going by the tagline ‘Biar Betul, Cuba Rasa’, the unveiling of Dutch Lady Chocolate Drink was preceded by a two-week long teaser campaign with samplings of the drink served to the public by roving ‘Biar Betul’ trucks through high traffic areas in the Klang Valley. Following the launch, Dutch Lady is running a four-month integrated campaign from September till December to get people familiar with the new product. 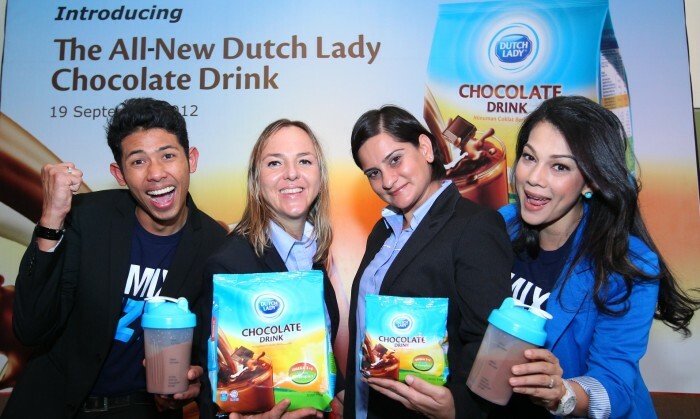 Ramjeet Kaur Virik (second from right), marketing manager of Dutch Lady Malaysia told A+M that the product marks Dutch Lady’s venture into the powdered chocolate drink segment. She added the product offers a nutritious option with additional goodness of milk added with Omega 3 & 6 and Vitamin B-Complex nutrients. “Currently we are already the market leader in liquid milk, with our chocolate UHT being the most preferred flavour. Thus, it was a natural progression to venture into this new segment,” added Virik. The post-launch campaign will see print ads, TV commercials on Media Prima stations, radio ads on Mix FM, My Fm and Sinar FM and in-store visibility in Giant hypermarkets and 99 Speedmart. The new drink will also be promoted via Facebook social engagement with its ‘Ezy Mix Party’ app and via its microsite. As part of the campaign, consumers will also come across the ‘Biar Betul’ truck, which will be travelling to key areas of Peninsular Malaysia to sample chocolate drink. Agencies behind the campaign include Universal McCann for media, AMS Dorland for creative, Gapture for digital and Rouge PR for public relations. The Wall Street Journal has unveiled one of its biggest design changes in recent years, offering up a more visual look and greater..